Have you heard of the exciting news? Slurpee lovers rejoice as 7-Eleven Philippines launches the first Slurpee Bring Your Own Cup Day on November 7, 2013 (Thursday). Originally started by 7-Eleven Australia, the one-day event created a phenomenon that made its way to Malaysia, and now, the Philippines. So what's so special about this day? Well, this is the day wherein you can have a fill of your favorite frozen beverage brand in any cup you want for only P29!! Yes, your favorite SLURPEE in any cup you can think of, as long as it will fit through the "MaCUPangyarihang Bilog" standee with a 9" diameter. A boot, a trophy, a hat.. anything! Let your imagination and creativity run wild, and who knows, you might be the winner of P5,000 cash! This event is in partnership with the world's leading soda company, Coca-Cola. 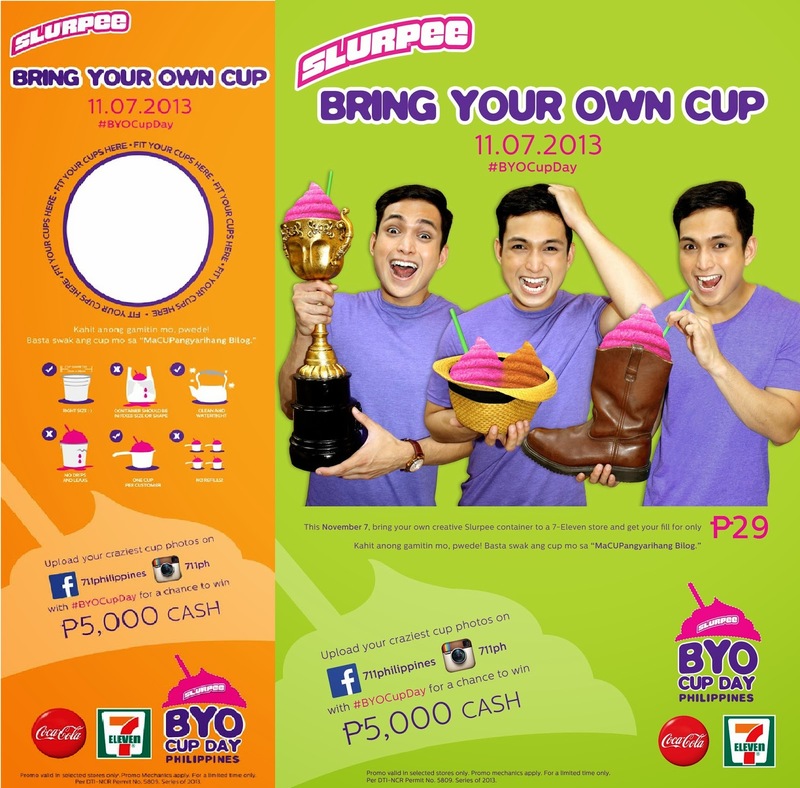 Can't wait for this day as I'll be sure to join this Slurpee #BYOCupDay madness! I'm still thinking of what "cup" to bring, but it will definitely be one huge and mighty cup just enough to satisfy our Slurpee addiction. Just upload and share your craziest cup photos on 7-Eleven Facebook Page or Instagram with the official hashtag #BYOCupDay. The crazier, the better. Just make sure that your "cup" is clean, leak-proof, and fixed in size and shape. So save the date and rush out to your nearest 7-Eleven store this coming Nov 7, to join the Slurpee craze and bring out the kid in you! Don’t forget to like 7-Eleven Philippines at facebook.com/711philippines and follow their Instagram at @711ph when you use the hashtag #BYOCupDay on November 7! May The Best Cup Wins! !